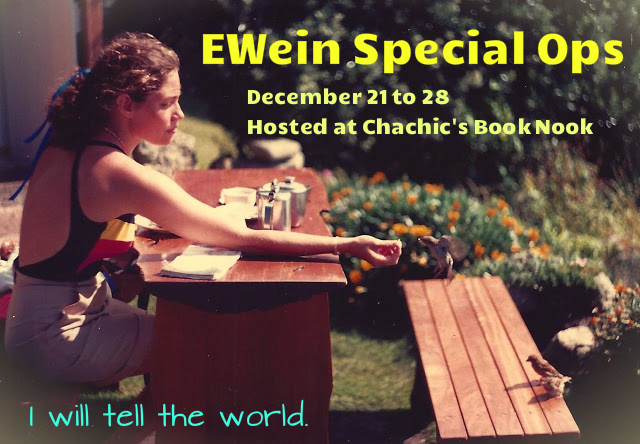 For the last guest post for EWein Special Ops, we have the Elizabeth Wein herself sharing something about her writing. Plus an exclusive artwork that hasn’t been published anywhere else before. I’m writing these words from Scotland, on the western edge of Europe. I don’t know where Chachic will be when she posts them for the world to read: Manila in the Philippines? Singapore? Somewhere on the Asian side of the Pacific Rim, anyway. I know for a fact that two of the contributors to this wonderful and flattering celebration of my books are based in the United States and one is based in Canada. Never mind the content of this week’s Book Nook postings—just think about the origins. What you’re reading here this week is coming from random points all around the world, and you’re reading it at a different random point somewhere else on the face of the global map. I think that’s pretty cool. I am not a cartographer and I am not really a map nerd, but I have never written a novel—or even a short story—without referring to a map. A real one. 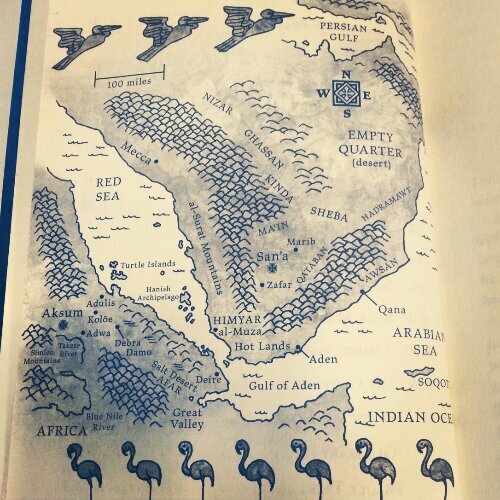 I drew my own maps for my Aksum books, and I am extremely proud of them, especially the one of South Arabia which appears in The Lion Hunter and The Empty Kingdom. You can read the books without the maps, though. They don’t really matter, except in that they are a physical and visual manifestation of the setting. It is the sense of place that counts. My favorite books have always been those that have a strong sense of place. When I think back to the fantasy writers who shaped my teenage reading, the ones that leap immediately to mind are Alan Garner, J.R.R. Tolkien, and Ursula K. LeGuin, and guess what? The books I loved best by these writers all include maps. Garner’s show a landscape based on a real place; Tolkien’s and LeGuin’s show imaginary countries, but that doesn’t make the settings for their fantasy worlds any less real in the context of their books. The world almost becomes a character in the novel itself. Setting shouldn’t just be there as a backdrop; a good sense of place will make a setting, fictionally speaking, into a living, breathing organism like our own planet, and the author’s love for and familiarity with the world of his or her creation guides us through the unfamiliar landscape like a virtual map. The fictional worlds I love best stand on their own, even after the story’s characters have moved on to Westernesse or the Dry Land. You could set your own story in any of these places, celebrating the world the way fanfiction celebrates fictional characters. Lleu and Goewin’s fictional Elder Field of The Winter Prince is not Susan and Colin’s fictional Alderley of The Weirdstone of Brisingamen, any more than Alan Garner’s childhood is my own. But Garner’s connection to the real world he lives in, and the way that connection shapes his imaginary fictional worlds, became a lifelong influence on my own writing. It’s interesting how “place” can also influence the creative process as I’m shaping a story. When I was writing Code Name Verity, I reached a point where all I really wanted to do was write about Scotland, where I live now. None of the action of Code Name Verity took place in Scotland at that point, and there wasn’t any reason for it to. But I was letting my Scottish narrator have quite a bit of free rein with the telling, and there was much about her that I didn’t yet know, so I figured we could both write about Scotland for a while and see where it went. The scene-setting—with its branch line railway and haunted castle and the one flight in the book that I actually made myself—was sheer indulgence. The plot points that came out of it—a key character recruited to RAF Special Duties—were integral to the novel. I hadn’t seen either narrative device coming. But how wonderful, and amazing, that they can work together like that. Goewin and Lleu. Artwork by EWein. It seems appropriate, when so many people have come together from such immense distances to celebrate my work here, to have had this chance to celebrate and share with you some of my thoughts regarding the notion of place within the story. I also want to thank Chachic for bringing together this stellar group of writers and readers and friends who have spent this holiday week, in various corners of the world, thinking and dreaming and writing about the worlds I have described in my books—some of them harsh, some surprising in their beauty, some embellished by my imagination, but all of them rooted in truth. It is just humbling to read your words of praise and encouragement. It means that my own words are not just being thrown out there into a vacuum. You are passing them on. Happy new year to all readers all across this world! This concludes EWein Special Ops. I hope you all had fun going through the posts. The giveaways are still open until next week, click here to check them out. My good friend Maggie of Young Adult Anonymous generously got me a signed copy of Code Name Verity a few months ago, so I knew she would be perfect for EWein Special Ops. I’m a book hoarder. When I love a book, I get as many editions as I can. My justification is that not only am I filling up my shelf, but I’m also creating a shelf for my future child. I see myself as a curator overseeing the portraits of characters that I hope will line the walls of my child’s mind. However, I still read primarily for myself. What I love about reading is that even though I’m no longer a child, I can still be shaken and affected so much by what I read. 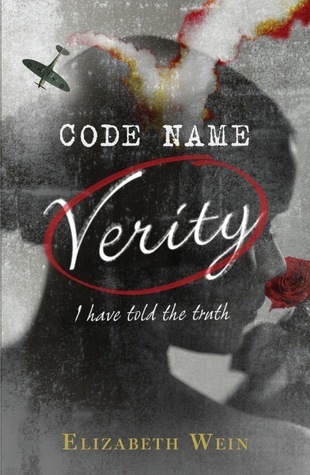 One of the books that shook me to my core was Code Name Verity. I was sitting on an uncomfortable, backless stool in the ER, having accompanied by stepbrother after he drunkenly sliced his finger open at 3am, and I needed something to distract me from strangling the drunken mess in front of me. Enter Verity. For the next few hours, as we were moved from room to room, I stayed in Ormaie with Queenie. I was transfixed by this story of friendship, survival and war. It’s like being in love, discovering your favorite author. I have been in love with Elizabeth Wein ever since that night and fell even more so with Rose Under Fire. I love that her characters are ordinary girls put in extraordinary circumstances. They are badass and fierce, but also scared and flawed. There’s a realness to them that went straight to my heart. These are special books and I’m thrilled to be part of the EWein Ops team. I have told the truth. Thank you, Maggie! I love that you’ve bonded with other book lovers over CNV. I’m so happy we’re both EWein fans. Tori is a longtime fan and friend of Elizabeth Wein. She has a series of sweaters inspired by Elizabeth Wein characters, several of which can be seen here. She is here today to talk about growing up as an EWein fan. Please give Tori a warm welcome! I was thirteen when The Winter Prince came out; I read it because I was going on a field trip to a book reading. I’m not sure I was always so conscientious, but it was set in Arthurian England, and I was into King Arthur and Ancient Rome. I loved it. 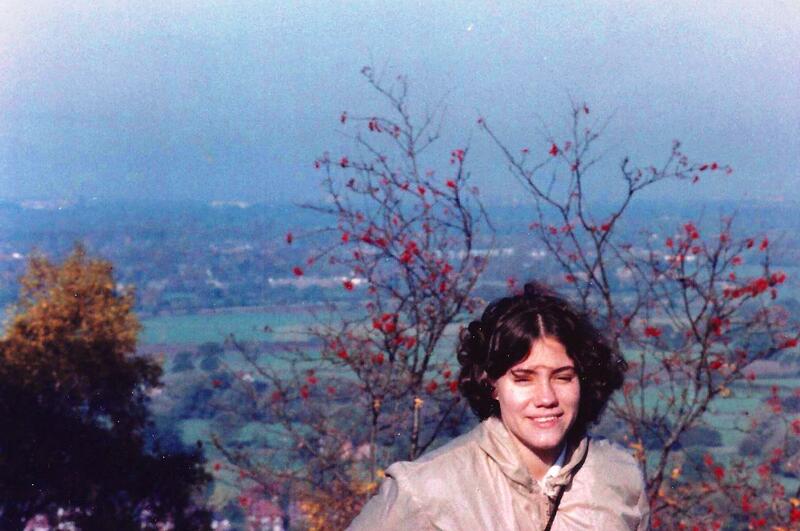 When I was fourteen, I was sure I wanted to be a writer. My mom, working magic as far as I could tell, called Elizabeth and asked if she wanted a teenage apprentice. I’m sure I wrote, but mostly, I remember reading lots, a rather eclectic list of things I almost definitely wouldn’t have picked up on my own (things like The Mabinogion, The Owl Service, and “The Wasteland.”) I sometimes joke that my taste has been formed by Elizabeth Wein, but I was fourteen and my brain was a sponge; it’s not that big a stretch. We fell a bit out of touch when she moved from Pennsylvania to England and then Scotland; it was before everyone had email, and I am a dreadful correspondent if stamps are required. I waited patiently for A Coalition of Lions to come out. (I roll my eyes at George R. R. Martin fans when they complain about wait time between books. I waited ten years for Coalition.) At some point between books, I spent a month in Istanbul, and every time I looked at a mosaic I thought of Lleu, and Medraut telling him that he had to see the mosaics in Byzantium. I tried to make all my college friends read The Winter Prince, and it was frequently one of the books I read to decompress from reading too many philosophers. A Coalition of Lions was the last time the release of one of Elizabeth’s books came out that surprised me. I was a senior in college, and I had checked Amazon randomly to see if it was ever coming out. And then, unable to wait for shipping, I started calling the bookstores I could walk to on foot to find out if they had it in stock and would put it on hold for me. I stayed up until four reading Coalition in a day. I finished, and I fished out an old email address I had written down and sent what was probably an only semi-coherent email, which reignited our correspondence. There are little things from all of Elizabeth’s books that pop up for me. It seems fairly constant. There is an Ethiopian restaurant I can walk to from my house, and even if just eating Ethiopian food of injera didn’t make me think of Telemakos, they serve a wine called Aksum; the first time I realized that I made us order it on the principle of the name alone. I’ve made my own vanilla extract, and everytime I do, I think of Medraut. I assess every umbrella as “Useful in an air raid?” I’ve burst into tears, seeing a discarded ballpoint pen, free from the bank, on the sidewalk because it made me think of Maddie and her fabulous Eterpen. On my commutes to work, I listen to history podcasts and when I hit names and real historic facts that are in her books (particularly the Aksumite-Arthurian books) I have been known to yelp with excitement, even though I am surrounded by strangers who probably think I a bit mad. Thank you, Tori! Sword Dance has to happen! Brandy blogs about fantasy and realistic novels (both middle grade and young adult) at Random Musings of a Bibliophile. She read and loved Elizabeth Wein’s Lion Hunters novels this year and in this guest post, she gives her perspective on what it was like to read these Arthurian books after she’s read Code Name Verity. Give it up for Brandy! 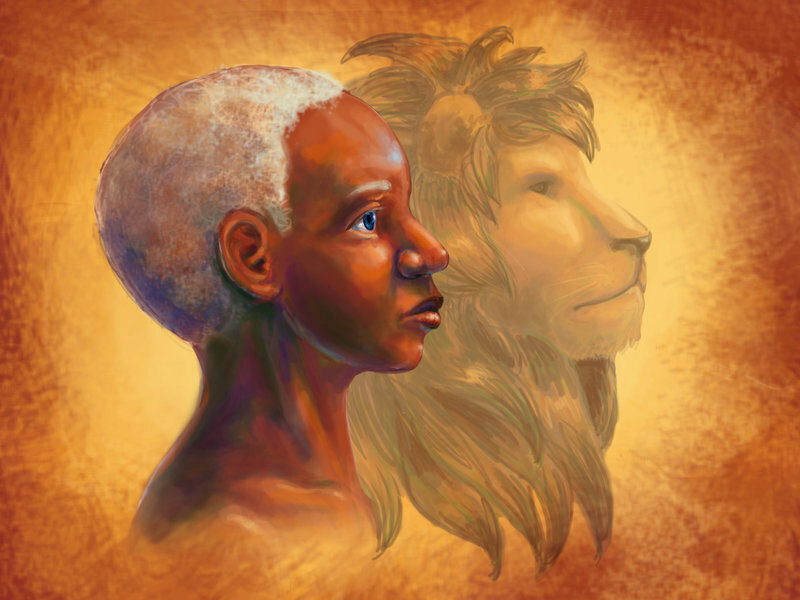 Being a member of Sounis (fan central for Megan Whalen Turner’s books) I had Elizabeth Wein’s Lion Hunter series recommended to me several times. And I tried. I tried so many times. I have to be honest though, I am not and never have been a huge fan of the Arthurian legend. There is too much that creeps me out. This was a huge obstacle for me when it came to reading The Winter Prince. I tried so many times, and each time I went a little further, but I always ended up not finishing. Not because it is badly written. Oh no. Yes, this was Wein’s (actual) debut novel, but Ms. Wein is an amazingly talented writer and her debut novel has more craft and skill in it than most people’s fourth or fifth. No, I couldn’t finish it because she is just too good at what she does, making you feel and know everything her characters do. As a result, Code Name Verity was the first of Wein’s novels I truly experienced. After that I could not imagine not going back and reading everything else of hers I could. I didn’t even care that I had to work to locate copies that were no longer in print. I did it happily. And I still wasn’t able to finish The Winter Prince. I didn’t let it stop me this time. I just skipped it and went on to A Coalition of Lions. Then I devoured the rest of the series within a week. There is so much to love about this earlier series and it deserves far more attention than it gets. Even now after the popularity of Code Name Verity and Rose Under Fire, it still isn’t as widely read as it should be. Too many people still refer to Code Name Verity as Wein’s debut novel. That needs to change. If you are a person who loves Wein’s writing in her two latest novels, there is nothing that will stop you from loving these too. What can you expect to get from these books? The same care and attention to character development you found in Code Name Verity. These are characters you will come to know and love, particularly Telemakos. I don’t know how any one could walk away from reading The Sunbird without him owning a huge chunk of their heart. The historical period is brought to life in such a way that you actually feel you are there. This is Ancient Ethiopian historical fiction too. No one can complain they have too much of that in their lives. Readers can also expect to see the same brilliant ability to bring hope and beauty out of despair and destruction. You won’t even have to hunt them down like I did. They are now available as e-books. There are no excuses. Thank you, Brandy! No excuses indeed. Click on the covers above to grab copies of the ebooks. Maureen is a library assistant who blogs at By Singing Light. Elizabeth Wein is one of her favorite authors and today, she talks about the theme of courage present in all of EWein’s novels. 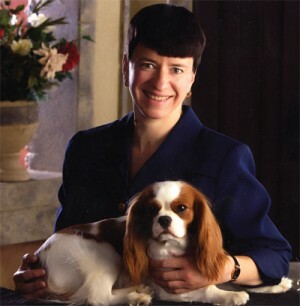 Please join me in welcoming Maureen to EWein Special Ops! Of course, the truth is more complicated. In fact, one of the brilliant things about Code Name Verity is the way it shows you a character who claims to be one thing, a coward, while disproving that again and again. To be frank, thinking about her bravery, the sheer audacity of it, takes my breath away and moves me to tears at the same time. But it’s not just Verity herself. There’s Marie, the French Resistance lassie, and Mitraillette and the rest of the Thibauts. There’s Anna Engel, risking her life every time she does not translate exactly what is written, giving Maddie a scarf. And Georgia Penn, speaking of audacity. Read her scene again and think about the courage it would take for both her and Verity to enact that careful dance of words and movements. There’s Maddie, finding the strength to do the hardest thing, and then to keep living afterwards. And there’s Queenie’s mother, leaving the window open. But bravery is a strand that runs through all of Elizabeth Wein’s books. In Rose Under Fire, there are not heroics in the usual sense, in the Verity sense. The bravery there is required to keep living, to stay human under circumstances that are designed to keep you from doing either. It’s perhaps quieter than Code Name Verity, but it is just as present and just as intense. Starving women standing for hours in the snow rather than giving each other up. It’s in The Winter Prince, in Lleu struggling against sleep and Medraut struggling against the darkness in himself. It’s in A Coalition of Lions, in Goewin leaving Britain behind, setting out alone into the unknown. Certainly it’s in The Sunbird — like Verity, Telemakos leaves me breathless. And in The Lion Hunter and The Empty Kingdom, he must find a different kind of courage to win through a situation that looks impossible. It seems to me that in all of the books, courage is one of the markers that point us toward the moral characters. When so many of them occupy a morally grey area, it is a signpost that tells us who deserves our care. Von Linden and Anako fail their tests; they do not even have the bravery to do their own dirty work. (Von Linden is a much more complex character than Anako, but in a way that makes his failure greater.) Even Nick, in Rose Under Fire, doesn’t have the courage to wait for Rose. On the other hand, Anna Engel acts with courage, as does Medraut. It’s this quality that sets them on the other side of that line. It’s worth noting that the kind of courage I’m talking about, the kind that these books value, is not the same as honor. It’s not even necessarily physical courage, although it can be (in The Sunbird, for example). It’s not limited by age — see Telemakos and Amelie Thibaut — or by gender — see EVERYONE. Not the courage to fight the war or fire the gun, but the courage to do what is right, to face darkness internal or external and not give in. It’s the strength to keep going, to fly the plane. This courage is not found in isolation. 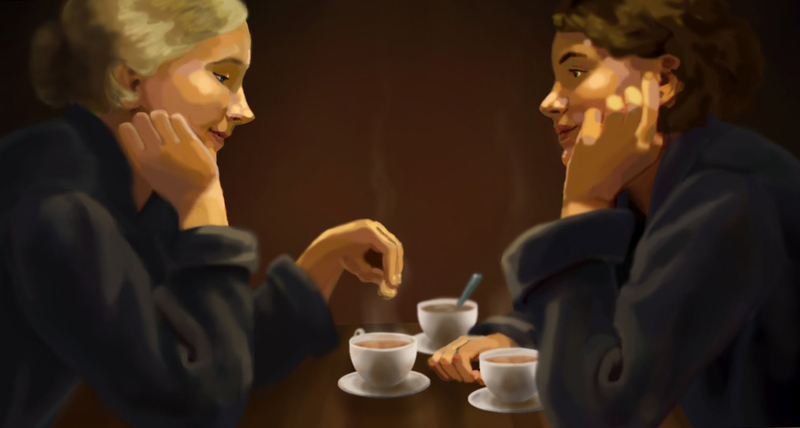 The friendship at the heart of Code Name Verity is not an accident. Verity retells the story of Queenie-and-Maddie, the sensational team, precisely because it gives her strength. Outside of that bond, Mitraillette is the one who keeps Maddie together in those frightful first days after the bridge. For Rose, in Ravensbruck, it’s Irina and Roza especially, but the whole of Block 32, which “was really, really good at propping people up.” Even Telemakos in Abreha’s palace is driven by Athena, proves himself with the other palace children. And it’s Goewin and Telemakos under the city, drawing pictures on each others’ hands to chase away the darkness. It’s not an accident that the image of hands keeps showing up, from Arthur’s hands on Medraut’s shoulders in The Winter Prince, to A Coalition of Lions. And again in Code Name Verity with Marie and Verity (“the backs of our hands were touching”); on the cover of the US edition; with a hand on Maddie’s shoulder while she flies. And yet again when Rose and Irina share that secret symbol of who they are: taran. Wein’s books consistently undermine the narrative of lone heroes: again and again, we see that we are saved in the company of others, that in the dark places the important thing is who stands beside you. After all, that’s what stories — the best stories — are. A light to see by, a hand holding yours in the dark. Thank you, Maureen! I love that last line. Maligayang Pasko! 🙂 Merry Christmas, everyone! I hope you’re all having a festive holiday season with your friends and family. Ours is more subdued than usual because my Lola (grandmother) passed away a few days ago and we spent Christmas at the funeral home. The giveaways are open internationally and the winner will be chosen on January 2. Good luck and please spread the word about it! Again, Happy Christmas Eve to all of you! 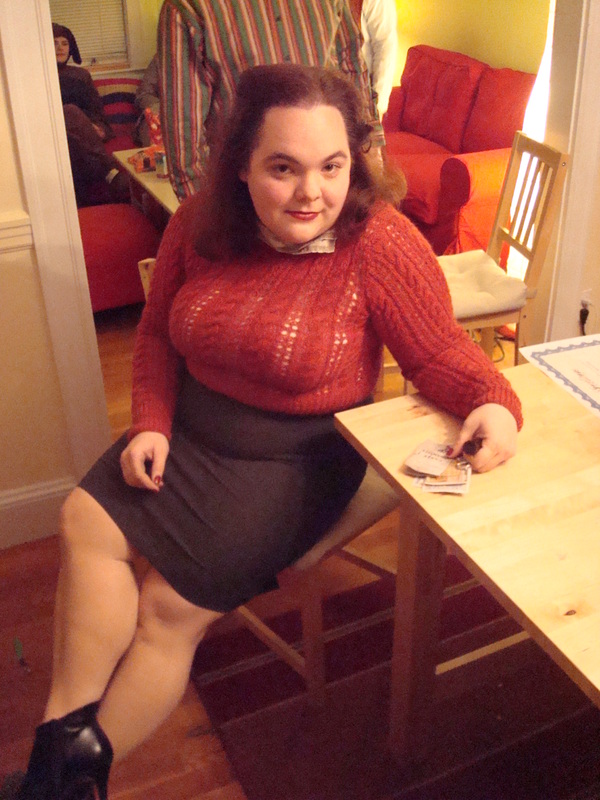 Liz is a New Jersey librarian who blogs over at A Chair, A Fireplace and a Tea Cozy at the School Library Journal site. 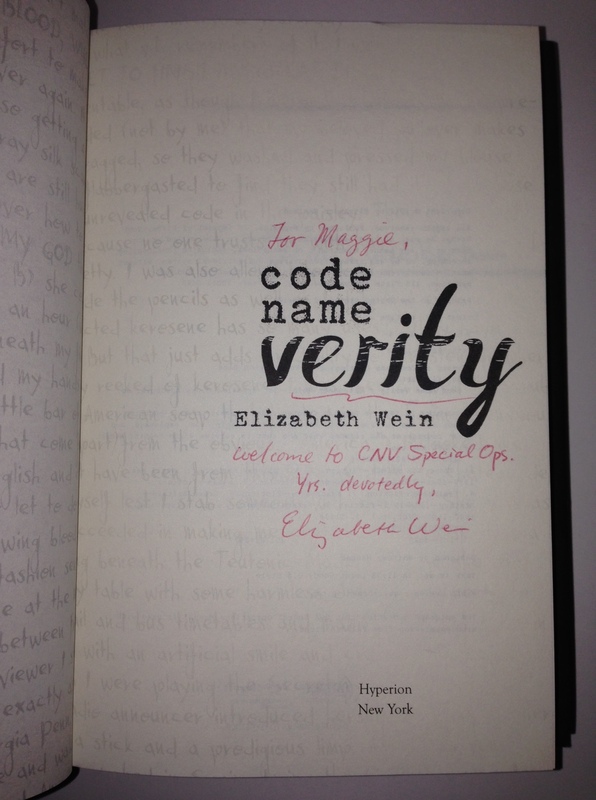 In this guest post, Liz talks the many reasons why she loves Code Name Verity by Elizabeth Wein. Spoiler warning for Code Name Verity, please skip this post if you haven’t read the book! A love letter to Code Name Verity. 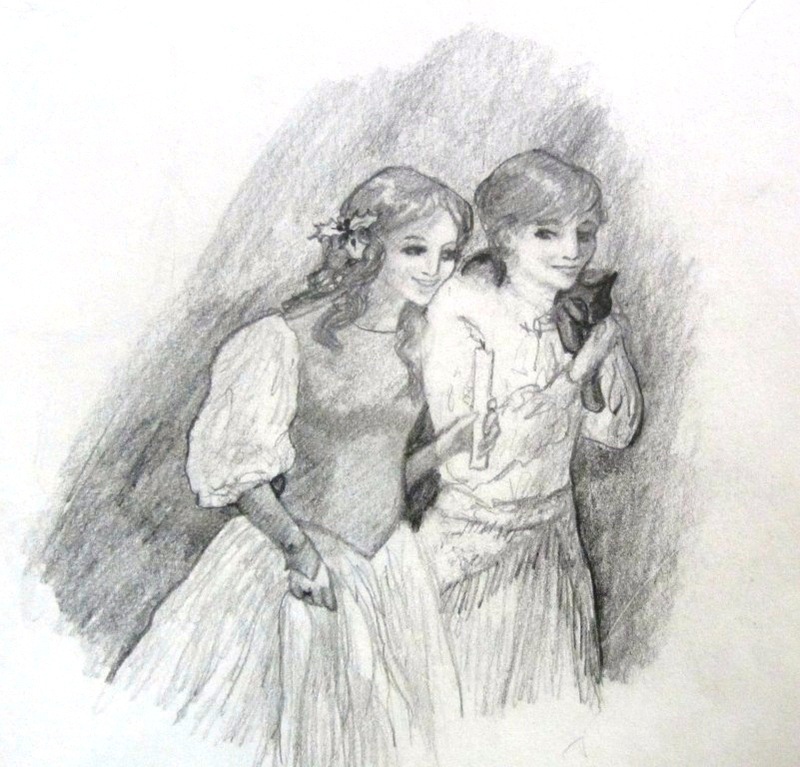 Image from Elizabeth Wein’s website. And then I kept reading. And began to understand more about the narrator, and began to cheer her on, despite her being a coward who sold out for a warm sweater, because of the story she was telling and how real she became to me, and, of course, who wouldn’t be a coward, in her situation? And I noted some of the cleverness going on, with the narration, such as how long it took to reveal her name to us, and I thought I understood the type of clever Elizabeth Wein was being. Making us be sympathetic to someone who gave up codes to the Nazis for a warm sweater and the chance to write out a story. Making us feel for that girl. And then that page came, when I realized, the narrator had a name other than her code name (Verity), or the name she used in her writing (Queenie) and she had a purpose other than what she was telling her captors. And that, perhaps, yes, Julie – that’s her name, of course you know that, her name was Julie – was telling us the truth all along. Oh, not about some things. If you’ve read Code Name Verity, you know that yes, Julie is a spy and she has been captured and tortured and she writes out her confession. All true. What isn’t true is what she confesses; what isn’t true is the story she tells the Nazis. She figures out just how much truth and lies to mash up, and she schemes to include a message to those outside the walls of her prison, and that message isn’t “I am here” or “rescue me.” It’s all about her mission, always her mission. Because so much of Julie’s writing cannot be trusted, Code Name Verity demands a reread. It’s the perfect example of how spoilers don’t matter to a well-crafted story. Oh, don’t get me wrong – I would not deliberately deny to any reader the discovery of the truth behind Julie’s story. But once the “reveal” is revealed, to go back knowing, to go back truly being in Julie’s head – this time, this reading, is different. Because, even more so than the first time, you are with Julie as she writes – rather than being with Julie by reading what she’s written. And this – that Code Name Verity remains just as strong, if not stronger, once “the secret” is known, is half the reason I love this book so much. The other half is Maddie. Part of what Julie writes about is the friendship between Queenie and Maddie, and even in the lies and exaggerations (what better way to believe someone is a coward, than to name her something that sounds spoiled, indulged, and soft? “Queenie” indeed) there are truths. Why, some wonder, did Julie include any of these things? Isn’t that too much to believe, that she would include these meanderings and side shows that become important to the reader, or to Maddie, or to understanding Julie better, but are nothing to the Nazis demanding a confession? Because. Because even as Julie was being smart and clever, she was trying to keep herself from being what she confessed to: a coward. Oh, it’s OK to be the type of coward who admits fear and then gets on with what has to be done, and I believe that is the type of coward who Julie is. It’s not OK to be the one who lets cowardice control what they do. And Julie, broken and cold and captured and not quite sure if her gamble would work, needed to remind herself who she was. But because at its best, what friendship can give us, is seeing ourselves through another’s eyes and knowing we are worthy. We are good, we are kind, we are brave, we are smart – we are not cowards – because of that person. And how that person sees us. One of the most satisfying parts of Code Name Verity is discovering that yes, Maddie is real, and yes, Maddie and Julie’s friendship is real, and yes, Julie was telling us the truth, and herself the truth, that she has such a friend. And that is why I love Code Name Verity: because it’s about lies and stories and friendship, and how we see ourselves and how we need others to see the truth about ourselves. Kiss me quick! Thank you, Liz. EWein Special Ops: Tell the Truth. Tell the World. Happy Christmas Eve, everyone! For today’s EWein Special Ops guest post, we have Shae from Shae Has Left the Room (previously, the blogger behind Bookshelvers Anonymous) here to talk about Elizabeth Wein’s Code Name Verity and Rose Under Fire. Shae likes reading middle grade and young adult novels from fantasy, sci-fi, dystopian, historical fiction and magical realism genres. Please give a warm welcome to Shae! Tell the Truth. Tell the World. My love for Elizabeth Wein and her work is probably the worst-kept secret in the history of faux secrets. Snagging Code Name Verity from my store in exchange for the book I was currently reading was one of the best decisions I’ve ever made in my reading life. Then Rose Under Fire took all the hope, heartache, wonder, fear, despair, and awe I felt in its predecessor and deepened them. I struggled for a long time over what to talk about for Chachic’s appreciation week. The power of friendship? The refreshing use of female friendship? The equally refreshing lack of an overpowering romance in either book? The way Ms. Wein uses common household items (chocolate bars, open windows, green lights, red toenail polish) to inflict EXTREME EMOTIONAL PAIN?! Or should I throw form and format to the wind and use my time to flail and freak over the way Ms. Wein can construct a sentence like no one I’ve ever read? All so tempting, but out of Ms. Wein’s many contributions to the world at large, I think the one I appreciate the most is how she bypasses the easier historical narratives to tell those that need to be shouted. Both books, despite their differing narrative structures and separate narrators, drill down to one joint idea: telling the truth and the power of words. The tagline for the Code Name Verity is “I have told the truth.” The tagline for Rose Under Fire is “I will tell the world.” As the first-person declension indicates, these are statements made by the narrators in the books themselves, core values visited again and again at crucial points in the plots. These simple sentences are also more than beliefs held by Verity and Rose. They are, in a way, Ms. Wein’s mission statements to her readers. Even the silliest of books teach as they entertain. A joke book teaches the societal construct of humor and the way language can be manipulated to draw out a laugh. A dry, serious tome beloved by academics might pontificate drily about various beliefs in the areas of philosophy, ethics, and human behavior. A picture book will impart social norms and desired behavior even as its bunny-eared protagonist chases her lost balloon. Code Name Verity tells the solemn truth through proven historical fact. It is not a book filled with sensationalized moments of pathos or fiery, Hollywood-appropriate escapes. To be sure, it is an exciting and bittersweet story, but its strength lies in its veracity. Code Name Verity is about a female ATA (Air Transport Auxiliary) pilot and a female SOE (Special Operations Executive) agent in the service of Britain during World War 2. Both are pulled behind enemy lines (one into a Gestapo prison) and must fight their way home. This story is unique for allowing multiple female narratives in a major war where the females in question are not 1) nurses, or 2) civilians feeling the effects of the war back home. Verity and Maddie deal with the war and its dangers personally but also in a way that is historically accurate. Verity, our spy, is not James Bond. Maddie, our pilot, is not the Red Baron. Their roles are restricted to those allowed to women in their time, but these same roles are often hard for modern readers to swallow, having been taught in schools and by the media that only men did anything important in the past. Rose Under Fire takes Code Name Verity‘s mission and expands upon it. Now we meet Rose Justice, a naive young pilot from America who strays behind enemy lines and is sent to Ravensbrück, a women’s concentration camp, where she meets other war prisoners. 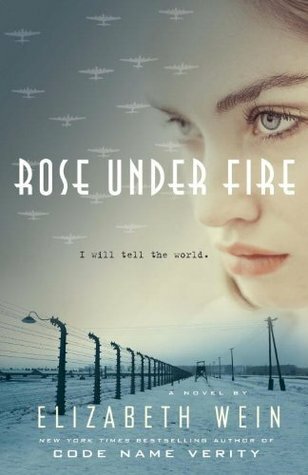 Through Rose we meet Russian fighter pilots, French Resistance fighters, Polish prisoners-turned-medical-experiments, American poets, and German traitors. All women, all influencing the war with their actions, with their bravery, and, most powerfully, with their words. To the modern eye, Verity’s and Rose’s tales may seem fantastical. Women in war? Women on the front lines? Women being imprisoned, tortured, interrogated, experimented upon, and killed? Hollywood. That’s not real life. Men are the ones who shape the war, who fight in battles and make the big decisions. (To which I say bull patties!) This is where Ms. Wein’s dedication to telling the truth shines. The lack of sensationalism for the sake of a good story bolsters the effect of the narrations. It allows the emotional impact to travel farther and hit harder than a half-baked book packed with minimal facts and cheap thrills. As moving as Verity and Maddie’s and Rose’s stories are in their own right, as much as you are tempted to bend beneath the weight of the tales, nothing compares to the bone-deep certainty that Ms. Wein has kept her promise. She has told the truth. Our narrators may not be real people, but the others they meet and the situations they encounter are. Though shoved behind the narratives of generals and politicians, the real-life stories of the Ravensbruck Rabbits, SOE agents, and ATA pilots who not only turned the tide of the war but also aided justice during the Nuremberg Trials after the fall of Germany have found a new stage in her works. She has kept her promise. She has told the truth. And she has told the world. Thank you, Shae! I love the power of words theme in EWein’s writing as well. RosaleeLuAnn is a fellow member of Sounis. She’s an artist who makes fanart for some of the books that she loves (link to her Deviantart page). I’ve asked her to talk about the two pieces of art that she’s made related to Elizabeth Wein’s novels. Welcome to EWein Special Ops, Rosie! Though The Winter Prince is still my favorite of Elizabeth Wein’s books, The Sunbird and Code Name Verity were very significant to me as well, which is why I think I felt driven to create some fanart for those books. Which is strange because reading these two books in particular was more painful than most reading experiences I put myself through. Oh, Telemakos. Why are you so awesome. It hurts. Aside from just loving the books, there were a few other reasons for wanting to make the pictures. At the time I had just recently learned how to paint in Photoshop, and I wanted to experiment with painting something for fun. Also, Telemakos is just such an interesting-looking character, I wanted to see how he would come out if I tried to paint him. 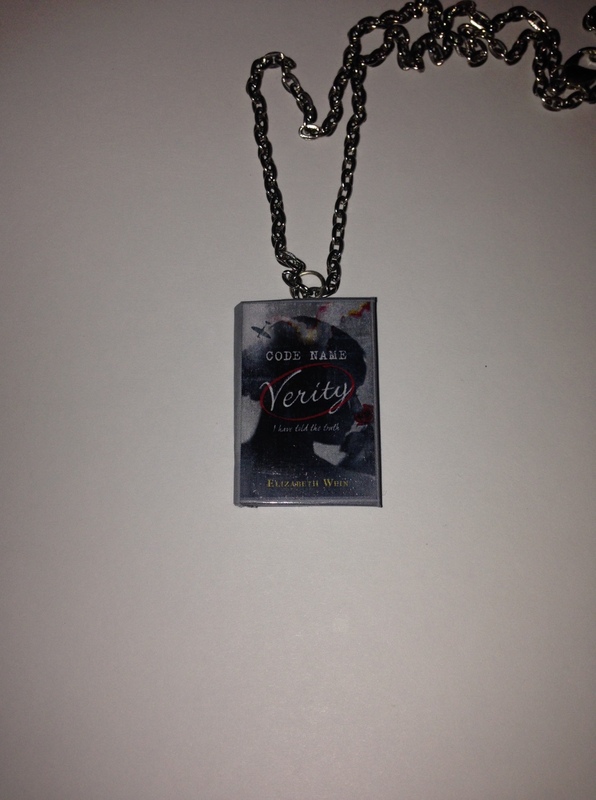 It wasn’t until years later that I made the Code Name Verity piece. I was actually still trying to learn how to paint in Photoshop (Illustrator is still my preference – vectors just make more sense to me, for whatever reason), though I had gained a little bit more experience by then. I was very rusty with painting and art in general because I had just served an 18 month mission in the Philippines (gusto ko talagang bumalik sa Pinas!) and hadn’t really done much other than sketching in that time. I read Code Name Verity and loved it, but again, like The Sunbird, it was a very painful (and completely wonderful!) book. I remember specifically wanting to find a happy scene to illustrate, one about the friendship that is the center of the story. I didn’t have anyone to be a model for the photo reference except myself, so thats the reason that the facial structure on both faces looks really similar. I also only had the vaguest idea of what they were supposed to be wearing and nothing really to use as a costume, so I completely made that up. Also, I didn’t have a tablet, so I painted it with the little mouse pad thingy you use on laptops instead. All I wanted was to have fun making a piece of fanart for myself, it was extremely satisfying when others, including Elizabeth herself, liked what I did. Thank you, Rosie! I think you did a great job with both of these pieces. I wish I was as artistic as you are. Rachel Neumeier is the author of fantasy novels House of Shadows, the Griffin Mage trilogy, The Floating Islands and The City in the Lake. I love chatting with Rachel about the books that we love because I feel like our tastes in books overlap. I knew I had to ask her for a guest post for EWein Special Ops since I know she enjoyed reading Elizabeth Wein’s novels. Give it up for Rachel! I should start with a confession: I haven’t read CODE NAME VERITY. Nor have I read ROSE UNDER FIRE. But I have an excuse! See, if I am working on a new book of my own, I really can’t read anything that is too emotionally compelling. Because if I start a book like that, I am going to be forced to drop everything and finish it, and that kind of compulsion is not your friend when you have work to do. Plus, a truly brilliant story lingers for days or weeks in my mind, its characters and story and setting suggesting different characters and stories and settings I would love to write. This makes it much, much harder to get back to my current work-in-progress. No, the right choice when I’m busy is a book I’ve read several times before, or else nonfiction. Books like CODE NAME VERITY and ROSE UNDER FIRE are the ones I set aside as a reward for finishing a major project. With any reasonable luck, I expect to read both of them, plus a couple of other special titles, somewhere in the second half of February, once I’ve finished the first draft of my current WIP. And how do I know that these two titles are worth holding out as a special treat? Particularly as I have been avoiding reviews of them, since I don’t want to be deluged with spoilers? Well, because they’re by Elizabeth Wein, that’s how. The first book I ever read by Wein, just a year or two ago, was THE SUNBIRD. I think I must have picked it up at a library sale or something, which goes to show why library sales are worth checking out, because THE SUNBIRD immediately wound up on my (very short) list of Truly Perfect Books. Telemakos was hiding in the New Palace. He lay among the palms at the edge of the big fountain in the Golden Court. The marble lip of the fountain’s rim just cleared the top of his head, and the imported soil beneath his chest was warm and moist. He was comfortable. He could move about easily behind the plants, for the sound of the fountains hid any noise he might make. Telemakos was watching his aunt. And if that doesn’t immediately make you curious, I don’t know what will. Telemakos has a very good relationships with his aunt, by the way. His whole family is fascinating and beautifully drawn, all the family members sympathetic but far from perfect, all the relationships strong but complex. I will just mention here that this story is actually part of a five-book set which begins with an Arthurian story before heading off in its own direction, so that various members of Telemakos’ family have actually stepped directly out of Arthurian legand. THE SUNBIRD is a fine place to start and stands alone just fine, but the series as a whole consists of THE WINTER PRINCE, A COALITION OF LIONS, THE SUNBIRD, THE LION HUNTER, and THE EMPTY KINGDOM. Each leads to the next but stands alone, except for the last two, which together comprise a single story. So, Telemakos. Telemakos reminds me of Megan Whelan Turner’s Eugenides, but he’s not the same – his strengths are different, and so are his weaknesses, and so is his family and the world through which he moves. Most of all the world, which informs all the rest. Because though THE SUNBIRD draws on Arthurian legend, it is set in the African country of Aksum. Aksum is simultaneously engaging and fascinating and charming and terrible. Generally an author of historical novels ratchets back the sheer horror of so much of history in order to appeal to modern readers. There may be slavery, for example, but we aren’t generally shown the sheer unutterable dreadfulness that attends some kinds of slavery. If Elizabeth Wein pulls back from showing us horror, I sure can’t tell. Two of the scenes in THE SUNBIRD are among the most intensely horrific scenes anywhere. Those scenes would be unbearable in the hands of another writer. Yet Wein pulls them off – even for me, and I have a fairly low tolerance for grim – through her sheer skill with language and by creating a story whose overall structure and themes are thoroughly positive. But still, intense is definitely the word. And that is why I am waiting for a break before I read CODE NAME VERITY and ROSE UNDER FIRE. Thank you for the lovely words, Rachel! I’m pretty sure you’ll love both Code Name Verity and Rose Under Fire when you get the chance to read them.